Panorama of SF from the Bay Bridge on the left, to the Golden Gate Bridge and then Sausalito on the far right. It's been over 30 years since I wandered the streets of San Francisco - way, way too long. As a mini-vacation was in order, we pulled together all our air miles and looked as what we could make happen. A four day week-end it was. While I personally knew this wasn't long enough, my partner thought it was more than enough. He was wrong. My earliest memories of this city was back in my early teens. The family drove over from Sacramento where we lived for the day - we couldn't afford a hotel. I managed to get an hour or so to myself and wandered through the enormous Pier One Imports warehouse. This was the time hippie culture ruled and The Beatles were exploring all things Indian from sitars to Nehru Jackets. 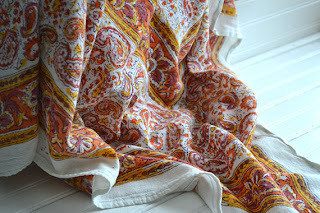 The large building was full paisley cotton bedspreads, unique metal jewelry, unusual carved wooden offerings and the smell of incense permeated every inch. Fishermans Wharf was a small dock with vendors selling lots of shrimp cocktail and cable cars were laden with tourists. Would any of this be the same? The answer was no. It was time to make some new memories. Our flights were courtesy of Aeroplan points, so availability dictated we had to take a 6 a.m. flight. I am not a morning person. Getting up at 4 a.m. was brutal, but the only other option was to arrive in San Francisco late in the day with little time to explore. Our flight ended up a dream. It loaded on time and actually arrived 25 minutes early, putting us in San Francisco at 8 a.m. As we couldn't check in until noon at the earliest, we decided to slow the day down by having breakfast at the airport. There were several ways to get from the airport to the city. We picked the middle ground - a shared ride van. It's a great balance between convenience and cost. The price varies slightly from company to company ($17 to $19 per person plus tip). You pick it up at a stand just like you would a taxi and it takes you right to your door. The only difference is there will be stops to accommodate the other riders. A taxi was the quickest, but more expensive. Cheapest was riding the BART, but we would have had to transfer to a bus while lugging our carry-ons. I thought we might try that on the way back, but I knew we would be tired on arrival and was worried about needing correct change for the bus. I have been stuck before in NYC trying to get on a bus with 2 one dollar bills and a quarter and being asked instead to pay $2.25 in change. What visitor has 9 quarters on arrival? 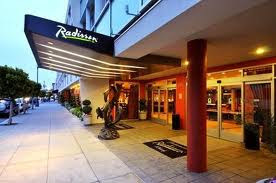 For a hotel we chose to stay at the Radisson Fishermans Wharf. It was booked through a hotel room sale site so we were able to get a great discount and being right on the wharf meant we didn't have to worry about the additional expense of a rental car. So it all balanced out. Many attractions are within walking distance, especially if you like to explore on foot. The historic F-Line with vintage street cars picks up outside and takes you all the way to the Castro District. One of the cable car routes is about 6 blocks away and several tour bus and hop on hop off buses are available nearby offering different options. The weather was beautiful, so we strolled through Pier 39 full of shops and resaurants, as well as what is now passing for Fisherman's Wharf - unrecognizable from the past -and Musée Mécanique, an antique penny arcade full of old boardwalk attractions.That was followed by a free walking tour led by a volunteer from SF City Guides (tips at the end encouraged and go to support the organization). During the summer up to ten guided walks are offered every day at a wide variety of locations. We chose Fisherman's Wharf: A Hidden History as it was supposed to offer a behind the scenes look into the history of the area. I usually love these and we had a lovely guide who picked us up at the starting point - Ghiradelli Square. Unfortunately she didn't have the gift of making history come alive and spent most of her time reading out dates and history from a book. Disappointing as she was a truly dedicated individual who wanted this to be great for us. After discreetly slipping away from the crowd, it was time for a quiet spot to relax and a enjoy a beer. I love architecture and am always snooping as I walk, so had noticed a quiet bricked in atria off the main street where Jack's Bar offered an outside patio dining area. There wasn't a lot of shade, but we did manage to snag one of the few tables under a tree. This place has been around a long time according to the vintage signs on display. Their specialty - 85 brews on tap. On this hot sunny day, it was great to sit outside in the shade, enjoy an icy cold brewski and a bit of a breeze. The only negative? All the drinks for the outside patio were served in plastic beer cups. Somehow just not the right ambiance. By this point it was noon and we'd been up since 4 a.m. We took a chance and strolled back to find - MIRACLE - our room was ready early. It was great to stretch out for a couple hours, enjoy a nap and look over some ideas of what to do next. As we love to explore on foot and the weather was so beautiful, we decided to hike from our hotel at the waterfront (to the lower right in the image above) up Telegraph Hill to Coit Tower and then walk the 400 step staircase down the other side of the hill to the waterfront at Pier 29 (bottom left in the image above). We loved it. Left - Note the tiny opening at the base of the tree. Right - think about moving your furniture in this house! Beautiful trees lined the street we walked up. What was most surprising was the the base only had about a 2 foot square opening in the concrete. I have no idea how the trees get enough water and nutrients to stay so healthy. Checking out the architecture of the houses was another plus of walking. We both had to stop several times and wonder at how people moved in furniture and carried in groceries. Many had garages on the street level with a flight of stairs just to reach the front door. Then there could be 3 floors of living space. So it was 4 floors from the street level to the top. Bet residents get a great workout every day just moving around their house. 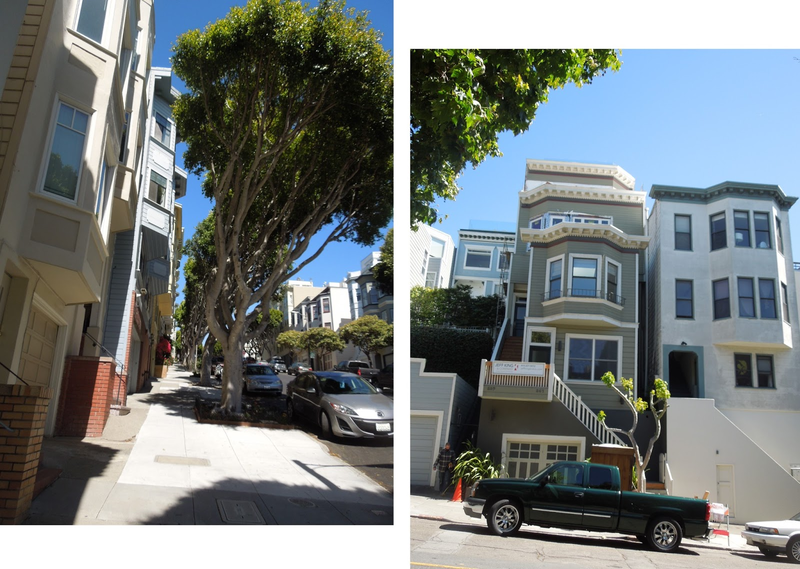 This walk up Telegraph Hill and down the other side ended up being Glen's favourite part of our trip to San Francisco. As it was also his birthday, I'm glad we found something he loved to do. 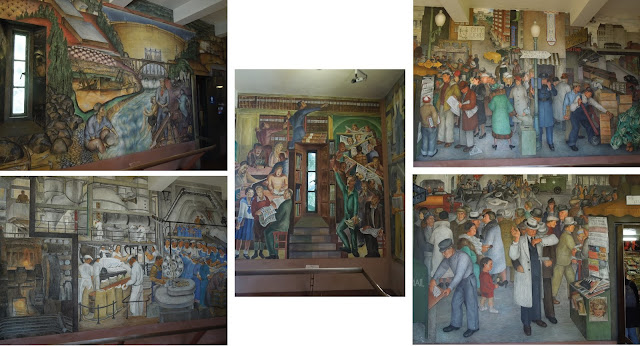 The walls on the ground floor of Coit Tower are covered with Southwestern style murals. These were painted in 1934 by a group of artists and depict life in California during the depression. While it is free to walk around here, to go up the elevator to the observation deck for a 360 degree city view costs a small fee - $7 for adults, $5 for seniors and teens, $2 for children 5-11 and under 4 is free. I love to find a high point in every city I visit so I can view it from above. This was perfect. 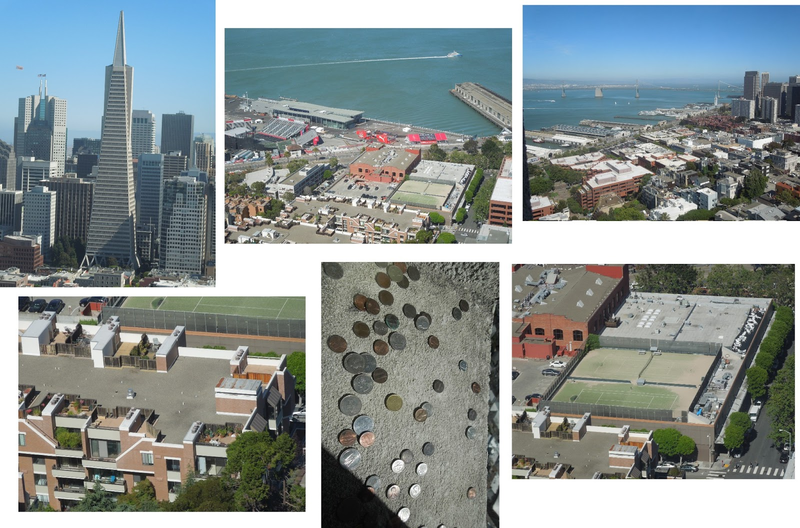 In addition to the cityscape, I saw the Transamerica Pyramid (still the tallest building in SF but probably not for much longer), the venue for the July 2013 America's Cup, rooftop patios/tennis courts/concrete sunning deck and coins on window ledges that were slipped through cracks in the frames. My best guess is that anyone leaving a coin also makes a wish. When you come back outside, you veer slightly to your right and walk across the parking lot. At the edge you'll find the start of a long stairway down the hillside. 400 steps sound like a lot, but it seemed to go easily and there were small landings along the way that offered a break. That said - I wouldn't want to climb UP those stairs as we saw several very sweaty, tired people doing. On the way down you're surrounded by foliage and shaded by a canopy of trees. There are small planters of flowers here and there along the way, the most unusual being 3 planted garden sacks hanging on a concrete wall beside where we walked. Most shocking were houses tucked along the staircase. These are real residences with absolutely no access by road. How did they build here - how did they get the furniture moved in - how tired do they get toting in groceries and other purchases? Everything has to be carried in on foot as far as we could see. Once we reached the bottom we were at Pier 29, so it was a bit of a walk back. I enjoyed it, but if you prefer to ride you could always jump on the F line. Almost all of the piers along the way have been converted to other uses. Some had restaurants, but a lot were filled with parking spaces. Not sure if any was public parking or if it was for specific vehicles. If we had walked the other direction we would have reached Pier 1 which has been converted into a large Farmer's Market. Hopefully I will get to check this out on my next trip to the area. Here is one interesting fact. If you stand on the sidewalk facing Pier 1 - all of the piers to your left are odd numbered and all of the piers to your right are even numbered. Once we were back at Pier 39, we decided to check out the restaurants. In the middle of all the shops, there is a 2 level carousel and next to it a stage where performers ply their trade for tips. We lucked into the end of a performance by 3 students attending the local Circus Center training school. One performer was a triple threat that involved juggling, a tall unicycle and a steady stream of comedy. The other 2 were acrobats who also assisted the unicyclist and emcee'd the show. When they were finished, we decided we felt like casual and easygoing dining so chose the Wipeout Bar and Grill. They had picnic tables outside which were full and then basic tables inside. As the restaurant had tons of seating inside, it was only a few minutes wait. There was also a large staff on hand to make sure everyone was served quickly. Outside dining Pomegranate Margarita One section of the large inside dining. I liked the fact the menu was varied enough to provide something for everyone. Portions were generous without being overly crazy. I wanted something cool so went with the Asian Chicken Salad. Glen wanted a hot supper so chose the Teriyaki Chicken Bowl. When I asked for a drink suggestion, the waiter offered a Pomegranate Margarita - sold! It was definitely refreshing. Be sure if you order drinks you know what size you're getting as I almost received a super large 23 ounce. After walking all day in the heat - I would have had to be carried back to the hotel. Menus can be viewed online for both FOOD and DRINKS. They are also have a Facebook Page with lots of images of different dishes to check out. So ends day one. It had a little bit of everything - just wished it had been longer.